Preheat the oven to 400 degrees F. Lightly grease a baking sheet, or line it with parchment. Drop the cookie dough by teaspoonfuls onto the prepared baking sheet (a teaspoon cookie scoop works well here), leaving 1 inch between them; these cookies won’t spread much when they bake. 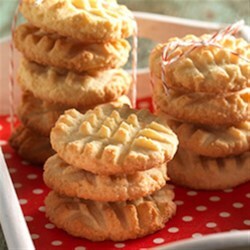 Use a fork to flatten each cookie to about 1/4 inch thick, making a cross-hatch design.